In 1984, Vicksburg was selected as one of the six original Mississippi Main Street towns. At that time, proponents of downtown Vicksburg had their work cut out as downtown Vicksburg was struggling from 1970s urban decay and suburban sprawl propelled by large malls and super stores. Now approaching its 25th anniversary, Vicksburg Main Street continues its efforts, with support from local and state partners, to create a distinctive, vibrant and flourishing downtown. In October 2003, the City of Vicksburg invested in a $7 million downtown urban renewal plan that included the Washington Street improvement project. This project provided for brick streets, turn-of-the-century lamp posts, new sidewalks, landscaping, tables, chairs, benches, hanging baskets, piped-in street music and the addition of the River Stage Plaza parking lot with restroom facilities in a five-block retail area in the Main Street district. Another $170,000 was spent on the two-level parking garage on Walnut Street for easy public access to 220 parking spaces. In 2005, the $2.8 million Art Park at Catfish Row was completed, which enhanced the area of the street where 26 murals had been painted on the flood wall portraying a timeline history of Vicksburg. Catfish Row continues to expand with the Motor Vessel Mississippi, Corps of Engineers Interpretive Center, the Transportation Museum in the old railroad depot, and the Fairground Street Bridge, which is on the list of National Historical Landmarks. The Fairground Bridge will be moved from its present location to serve as the skywalk from the interpretive museum to an observation overlook for the Mississippi River. Downtown Vicksburg is constantly “rolling out the red carpet” with activities for community members and visitors alike with many promotional events, such as the Downtown Fall Festival, Halloween Parade and Costume Contest, Old-fashioned Christmas Open House, Christmas Parade of Lights, Mardi Gras Parade, Riverfest, Miss Mississippi Parade and Fourth of July Fireworks Celebration. With more than 150 commercial properties in the Main Street Taxing District, the Main Street marketing slogan is Downtown Vicksburg… Where Everything’s Waiting for You! An exceptional mix of specialty retail shops, art galleries, restaurants, sports bars and grills, coffee shops and antique shops make Vicksburg a premier shopping destination. There are several hotels and even a casino in the downtown area with plenty of attractions, such as riverboat tours, carriage rides, the Art Park and Riverfront Murals. Since the 2003 Downtown Urban Renewal, more than 25 upper-level apartments have been built with residents occupying space above retail businesses. The downtown continues to move forward as the City is presently repaving the downtown central business district with a more than $1 million street project. 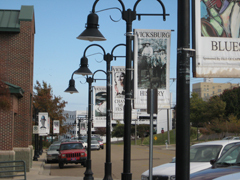 The success of downtown Vicksburg can be attributed to the Vicksburg Main Street Board of Directors, Architectural Review Boards and the Vicksburg Foundation for Historic Preservation, which has worked over the past six years with a very supportive city administration to instill pride in the people of Vicksburg. Downtown Vicksburg, the heart of the community, has successfully retained the charm of the past while blending with its vision for the future. “We invite you to visit Vicksburg and experience all that we as a community enjoy everyday,” Leyens said.